Agriculture Commissioner Ryan Quarles, second from left, presents Buy Local awards to, from left, Elizabeth Maggi of Ramsey Enterprises Commissary, Ouita Michel of Windy Corner Market, and William Hawkins of Bluebird Café. 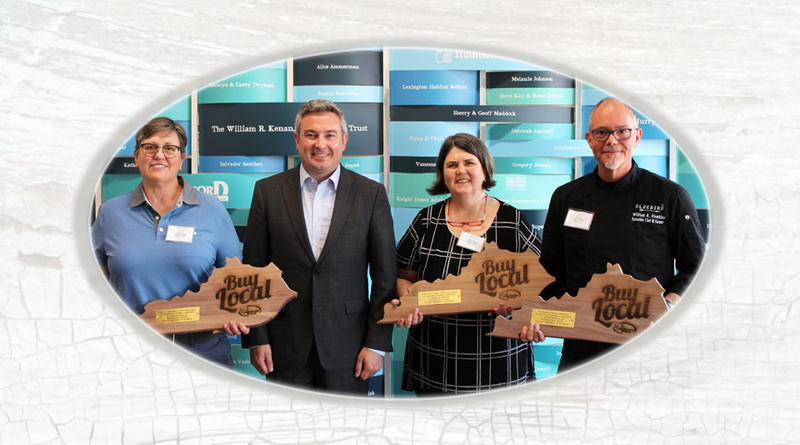 The following participants have been honored for reaching the lifetime cap and their commitment to purchasing Kentucky direct farm impact purchases, through the Restaurant Rewards & Buy Local Programs. The following participants have excelled in their commitment to purchasing Kentucky direct farm impact food for 2018, through the Buy Local Program.